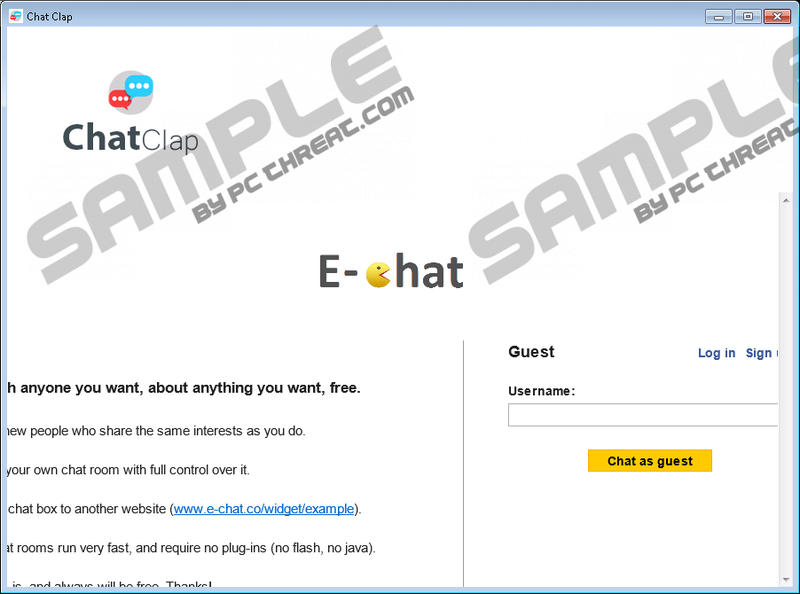 ChatClap is an adware program that you should avoid it at all instances as it holds no valuable features whatsoever even though it is advertised as a great tool to have. On its official website, the ad-supported program in question is marketed as a tool that should help you chat with your friends online right from your desktop, as it should be used as a standalone program. It surely sounds like a great tool to have; however, such statements are mostly used as a marketing gimmick to trick naïve Internet users into obtaining this invasive program without really understating what it is. In reality, this adware application will only cause major disruptions almost every single time you decide to surf the web. Additionally it at times could expose your operating system to questionable web content. Thus, ChatClap might not only be annoying but possibly malicious as well. There is no good reason to keep this adware up and running on your PC. Below we provide a detailed removal guide that will help you terminate it in just a few simple steps. Make sure to read the rest of this article to understand why the removal of this adware is imperative to your overall virtual security. As a standalone application, ChatClap does not function in the best possible way, to say the least. Often the adware in question crashes as well as it does not provide a lot of abilities to chat with your friends online since is most cases they need to have this program active on their PC as well. In addition to poor functionality, this intrusive piece of software establishes connections to adware servers without any notification. This is done by the help of a system service. The dubious service runs in the background and often has a random name; thus, killing it could turn out to be a rather difficult task. Even if you do manage to terminate the service, there is no guarantee that the intrusive activity promoted by this adware will stop since most likely the system service will be restarted on the next system startup. As soon as the connections are fully established your web browser will get filled with a vast amount of unwanted web content such as commercial ads, pop-ups, and coupons. Unfortunately, none of them are useful in any way; thus, they will only cause constant disruptions as you are surfing the web whether you like it or not. The only way to stop all these ads and pop-ups from being presented to you is by executing a complete removal of this adware. In addition, to being annoying, the ads and pop-ups presented by ChatClap could turn out to be dangerous as well. This is not that surprising because adware servers are quite infamous for being associated with malware distribution. Thus, you could be presented with a seemingly normal ad, which, in fact, could turn out to host a redirect link within it, meaning that you could end up on a questionable website just by clicking on such an advertisement. You couldend up on a site running the arbitrary code execution exploit. This particular exploit is favored by malware distributors as it allows them to implement their malicious software without the user’s authorization. This means that if you ever happen to enter such a site that will be more than enough to infect your operating system with some unknown malware. It goes without saying that such an instance could have disastrous outcomes. Therefore, it should be more than obvious that ChatClap is a program that you should not keep active on your PC under any circumstances. Make sure to execute a full removal of this adware program at the very same moment as it is found up and running on your computer. Follow the removal guide closely as a single mistake could mean that the intrusive adware program was not removed entirely. This is why we highly recommend every user to run an in-depth analysis of your operating system as soon as you are done with the manual removal. This way you will be sure that every single file, folder, and registry entry associated with ChatClap has been terminated from your computer. This is critical because at times this adware program could restore itself without any notification with a help of just a few leftover files or registry entries. Select ChatClap and click the Remove button. Quick & tested solution for ChatClap removal.